Over the years I've heard reference to "The Boundary Waters" or something similar but never really bothered to find out what was being talked about. It didn't sound like anything I was interested in. Then five or six years ago our son took his young daughters to the boundary waters for a few days. About all I understood was, 1) they would be out of touch, 2) they would be doing canoeing and camping in the wild and, 3) his wife was pretty concerned about him taking their girls into the "wilderness." Then this summer during our family vacation at his home in Minnesota John started talking about a possible backpacking trip "up there" and invited me to go along. ​As we talked (joined by our other son, Charles) the idea of doing a canoe trip entered the discussion and to make a long story short, that is what I and my and my two sons ended up doing for four days and three nights in early October. That trip will always rank among the top of my lifetime experiences. ​I am so grateful to John and Charles and our wives for giving us this wonderful gift. To see the experience, click the video at right for Part I. Click here to see Part II. Canoe trip route, starting and ending in lower left, Sawbill Canoe Outfitters. 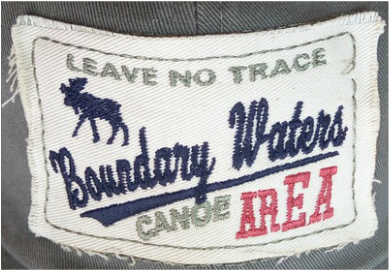 Click to see Part 1 of our Boundary Waters Canoe Trip. I won't spend much time describing the boundary waters but I suggest that you go online to find out about it for yourself. 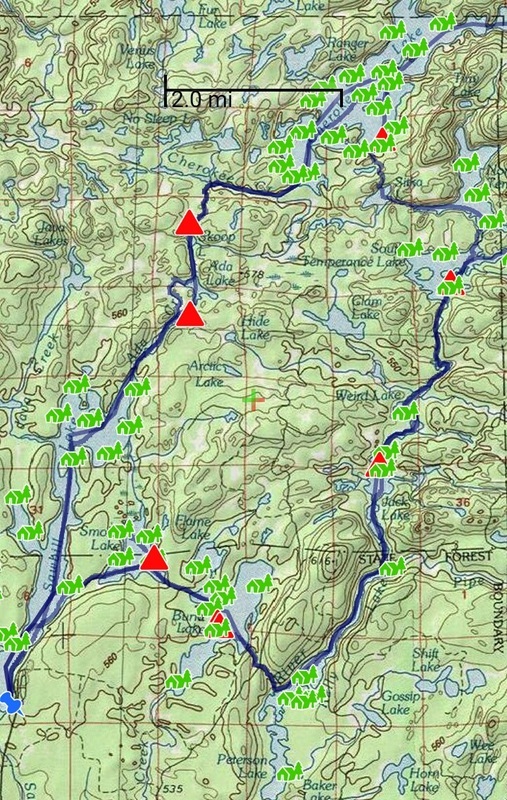 We entered The Boundary Waters in the Superior National Forest at entry point 38 near the south end of Sawbill Lake, about 20 miles north of Tofte, MN (the blue stick-pin image in the lower left of the map). We rented the canoe, paddles and life jackets from Sawbill Canoe Outfitters located there. The canoe was a 19 foot three person Kevlar light weight canoe. Weighing in at 50 lbs., it was big enough for the three of us and our stuff yet light enough that each of us could "comfortably" take our turn carrying it on the portages. The route we took was similar to the one Sawbill Canoe Outfitters calls "The Cherokee Loop", though we added the third overnight at Smoke Lake instead of spending two nights on Cherokee Lake. That gave us the three nights we wanted in the "wild" and got us back to Entry Point 38 mid morning on the 4th day leaving enough driving time for Charles and me to travel back to southeastern Wisconsin by way of Minneapolis where John lives. Day 1 we traveled north up Sawbill Lake then took the portages through the Ada and Skoop lakes and entered Cherokee Creek. There the route makes a sharp turn to the east and continues to Cherokee Lake where we camped the first night on site CMP0890. On Day 2 we traveled from Cherokee Lake south and east through Sitka and both North and South Temperance Lakes, then on to through Weird Lake to Jack where we camped the second night on site CMP0928. starts across from campsite CMP0825 and heads northwest to Burnt Lake. We stopped for lunch at Burnt Lake and then after lunch traveled on to Smoke Lake where we camped the third night on site CMP0921. Finally on Day 4 we took the short portage west from Smoke to Sawbill Lake and headed south to the Sawbill Lake Landing, where we our trip began. The weather was perfect with overnight's in the 40s and daytime's in the 60s and it was clear, calm and sunny for the whole trip. Best of all there were NO BUGS of any kind! The place has a reputation for bad bugs, especially mosquitoes but in October they appear to have all migrated south. We had two backpacking tents, a rain tarp (which we didn't even unpack) and a hammock for lounging. I took along my wood gas stove (see my page on wood stoves) and John had his jetboil stove. He cooked all the lunches on the jetboil. I fixed dinner the first night on my wood gas stove and we cooked on a campfire the last night. I believe he used his jetboil on the second night. We chose to go as light as possible, taking only what we could fit in or on our standard backpackers backpacks instead of using waterproof canoe bags. That helped us a lot in loading and unloading the canoe and on the portages. We lined them with heavy duty trash bags but they never got wet so we had no problems. We never lacked anything though we joked about not having comfortable camp chairs. The jokes turned to thanksgiving half way through every portage, that we didn't have those couple of extra pounds! All of our food was freeze dried or dehydrated so really all we did was boil water! Some of the food was from PackitGourmet, some from Mountain House and we had a few other things like instant oatmeal and a "gruel" I had concocted from some website that included oatmeal, chia seeds, oat bran, whole powdered milk, raisens or dried cherries, brown sugar and powdered peanut butter with a little cinnamon thrown in. And dried apple pieces! I also took some Great Value instant pudding mixes (for which I brought some powdered whole milk), hot chocolate, instant and ground coffee, candy bars, trail mix, etc. The chocolate and Pistachio pudding mixes were simply delightful. Wish I had brought along a small wire whip to mix them with as my pudding mixed with just a spork was a bit lumpy - but still mouthwateringly good! Without question the big highlight for me was having the experience with John and Charles. It was just plain fun to deal with and share everything with them. To say I'm proud of my sons would be an understatement. Too bad most of us live where light pollution blocks out most of the wonder of God so obvious in the sky..."
​The third highlight was discovering that even at my stage in life I can carry a canoe for quite a ways over less than ideal ground! Some concluding observations: A canoe trip with portages is not as strenuous as a backpacking trip and in some ways is more interesting than either backpacking or canoeing separately. At least on our trip, except for the first four miles or so northbound on Sawbill Lake, we never paddled or walked for much more than about half an hour. Granted the loading and unloading can be somewhat of a bother, but the reward is changing activities. Maneuvering over or around beaver dams is a challenge and really adds interest and problem solving to the trip. When you are backpacking (or carrying your bags on a portage) your attention is pretty much glued to your feet to avoid falling all over yourself or worse. While paddling the canoe you are free to take in the surroundings which in the Boundary Waters are magnificent. Many people base-camp and do day-trips. We elected to keep moving. I've never done the base-camp thing so can't speak to that but there is some adventure to keeping on the move which we all enjoyed. Finally, I've tended to think things like a canoe trip in the Boundary Waters are just for the select few somewhat unusual outdoors types. But after having been on several extended day backpacking trips and now this reasonably adventuresome canoe trip I realize I was wrong. "Anyone" can do it - and probably should! I don't believe you could come away sorry. Of course we didn't get attacked by bears, overrun by mice, or chased through the woods by wolves, and it didn't rain, we didn't get stranded by a wind storm... maybe next time!